LOUGH ARROW ICELANDICS' horses represent over 30 years of careful breeding of Icelandic Horses. We have 5 generations on the ground and know every one of our horses thoroughly. We have a valuable and now rare stock of very old proven blood lines which enable us to breed good breeding stock as well as wonderful allround leisure horses also suitable for competition. We breed beautiful natural tölters with well separated 5 gaits, lovely temperament and willingness to please the rider. Ideal goal: strong and healthy good-looking horses with easy tölt, nice color and the character and temperament to make a forever friend. Our breeding stallions live in a herd of four, socializing with each other when not with mares. Our mares, geldings, youngsters, and foals live in one large herd where they all learn to behave properly with each other. Our horses grow up under veterinary supervision, on 160 acres of mountain pastures with the Apishapa River running through, at an elevation of 7200 ft above sea level. They enjoy four distinct seasons with moderately hot summers and cold winters and around 325 days of sunshine per year. 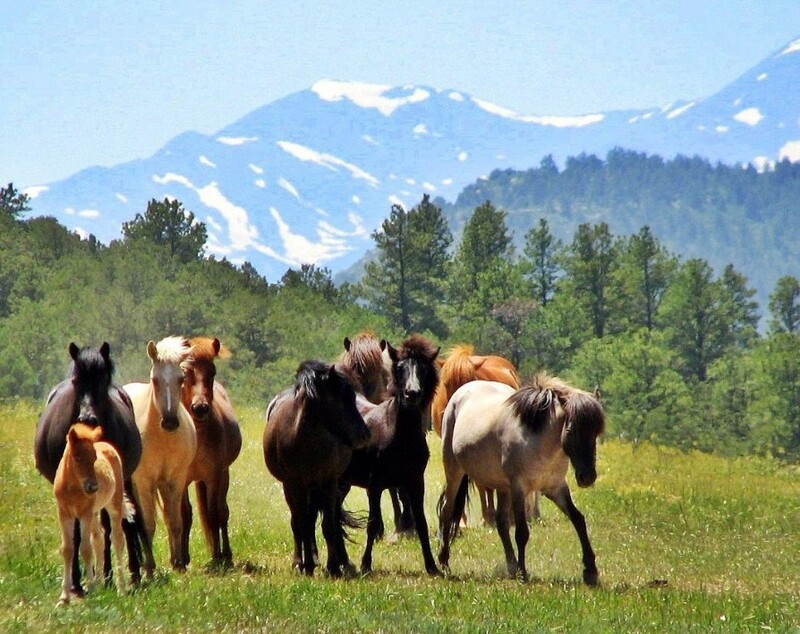 Southern Colorado is an ideal place for Icelandic Horses to live or even "vacation" in a comfortable climate without pesky bugs. STALLION SERVICE, RENT-A-MARE, BREEDING CONSULTATIONS, SENIOR BOARDING, RAISING YOUR YOUNGSTERS, VACATIONS FOR HORSES, SALES OF ICELANDIC HORSES OF ALL AGES.